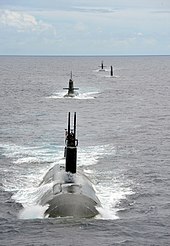 Whereas the principal meaning of "submarine" is an armed, submersible warship, the more general meaning is for any type of submersible craft. The definition as of 1899 was for any type of "submarine boat". 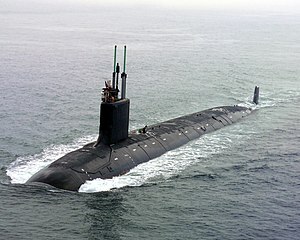 By naval tradition, submarines are still usually referred to as "boats" rather than as "ships", regardless of their size. 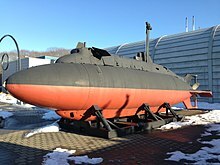 In other navies with a history of large submarine fleets they are also "boats"; in German it is an Unterseeboot or U-Boot (under-sea boat) and in Russian it is a подводная лодка (underwater boat). 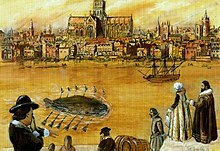 By the mid-18th century, over a dozen patents for submarines/submersible boats had been granted in England. In 1747, Nathaniel Symons patented and built the first known working example of the use of a ballast tank for submersion. His design used leather bags that could fill with water to submerge the craft. A mechanism was used to twist the water out of the bags and cause the boat to resurface. In 1749, the Gentlemen's Magazine reported that a similar design had initially been proposed by Giovanni Borelli in 1680. Further design improvement stagnated for over a century, until application of new technologies for propulsion and stability. In 1866, the Flach was built at the request of the Chilean government, by Karl Flach, a German engineer and immigrant. It was the fifth submarine built in the world and, along with a second submarine, was intended to defend the port of Valparaiso against attack by the Spanish navy during the Chincha Islands War. The first submarine not relying on human power for propulsion was the French Plongeur (Diver), launched in 1863, which used compressed air at 180 psi (1241 kPa). 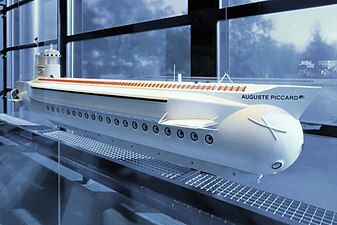 Narcís Monturiol designed the first air–independent and combustion–powered submarine, Ictineo II, which was launched in Barcelona, Spain in 1864. 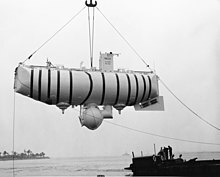 A reliable means of propulsion for the submerged vessel was only made possible in the 1880s with the advent of the necessary electric battery technology. 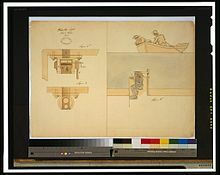 The first electrically powered boats were built by Isaac Peral y Caballero in Spain (who built the Peral), Dupuy de Lôme (who built the Gymnote) and Gustave Zédé (who built the Sirène) in France, and James Franklin Waddington (who built the Porpoise) in England. Peral's design featured torpedoes and other systems that later became standard in submarines. At the outbreak of the war, Germany had only twenty submarines immediately available for combat, although these included vessels of the diesel-engined U-19 class, which had a sufficient range of 5,000 miles (8,000 km) and speed of 8 knots (15 km/h) to allow them to operate effectively around the entire British coast. By contrast the Royal Navy had a total of 74 submarines, though of mixed effectiveness. In August 1914, a flotilla of ten U-boats sailed from their base in Heligoland to attack Royal Navy warships in the North Sea in the first submarine war patrol in history. The British tried to catch up to the Germans in terms of submarine technology with the creation of the K-class submarines. However, these were extremely large and often collided with each other forcing the British to scrap the K-class design shortly after the war. The Imperial Japanese Navy operated the most varied fleet of submarines of any navy, including Kaiten crewed torpedoes, midget submarines (Type A Ko-hyoteki and Kairyu classes), medium-range submarines, purpose-built supply submarines and long-range fleet submarines. They also had submarines with the highest submerged speeds during World War II (I-201-class submarines) and submarines that could carry multiple aircraft (I-400-class submarines). They were also equipped with one of the most advanced torpedoes of the conflict, the oxygen-propelled Type 95. Nevertheless, despite their technical prowess, Japan chose to use its submarines for fleet warfare, and consequently were relatively unsuccessful, as warships were fast, maneuverable and well-defended compared to merchant ships. The problem of the diesels causing a vacuum in the submarine when the head valve is submerged still exists in later model diesel submarines, but is mitigated by high-vacuum cut-off sensors that shut down the engines when the vacuum in the ship reaches a pre-set point. Modern snorkel induction masts use a fail-safe design using compressed air, controlled by a simple electrical circuit, to hold the "head valve" open against the pull of a powerful spring. Seawater washing over the mast shorts out exposed electrodes on top, breaking the control, and shutting the "head valve" while it is submerged. US submarines did not adopt the use of snorkels until after WWII. 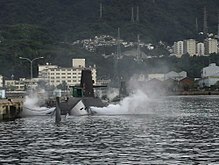 One new technology that is being introduced starting with the Japanese Navy's eleventh Sōryū-class submarine (JS Ōryū) is a more modern battery, the lithium-ion battery. These batteries have about double the electric storage of traditional batteries, and by changing out the lead-acid batteries in their normal storage areas plus filling up the large hull space normally devoted to AIP engine and fuel tanks with many tons of lithium-ion batteries, modern submarines can actually return to a "pure" diesel-electric configuration yet have the added underwater range and power normally associated with AIP equipped submarines. Most navies prohibited women from serving on submarines, even after they had been permitted to serve on surface warships. The Royal Norwegian Navy became the first navy to allow women on its submarine crews in 1985. The Royal Danish Navy allowed female submariners in 1988. Others followed suit including the Swedish Navy (1989), the Royal Australian Navy (1998), the Spanish Navy (1999), the German Navy (2001) and the Canadian Navy (2002). In 1995, Solveig Krey of the Royal Norwegian Navy became the first female officer to assume command on a military submarine, HNoMS Kobben. On 8 December 2011, British Defence Secretary Philip Hammond announced that the UK's ban on women in submarines was to be lifted from 2013. Previously there were fears that women were more at risk from a build-up of carbon dioxide in the submarine. But a study showed no medical reason to exclude women, though pregnant women would still be excluded. Similar dangers to the pregnant woman and her fetus barred women from submarine service in Sweden in 1983, when all other positions were made available for them in the Swedish Navy. Today, pregnant women are still not allowed to serve on submarines in Sweden. However, the policymakers thought that it was discriminatory with a general ban and demanded that women should be tried on their individual merits and have their suitability evaluated and compared to other candidates. Further, they noted that a woman complying with such high demands is unlikely to become pregnant. In May 2014, three women became the RN's first female submariners. Women have served on US Navy surface ships since 1993, and as of 2011–2012[update], began serving on submarines for the first time. Until presently, the Navy allowed only three exceptions to women being on board military submarines: female civilian technicians for a few days at most, women midshipmen on an overnight during summer training for Navy ROTC and Naval Academy, and family members for one-day dependent cruises. In 2009, senior officials, including then-Secretary of the Navy Ray Mabus, Joint Chief of Staff Admiral Michael Mullen, and Chief of Naval Operations Admiral Gary Roughead, began the process of finding a way to implement women on submarines. The US Navy rescinded its "no women on subs" policy in 2010. ^ James P. Delgado (2006). "Archaeological Reconnaissance of the 1865 American-Built Sub Marine Explorer at Isla San Telmo, Archipielago de las Perlas, Panama". International Journal of Nautical Archaeology Journal. 35 (2): 230–252. doi:10.1111/j.1095-9270.2006.00100.x.